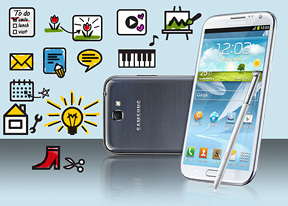 The S Pen truly is pivotal to the Samsung Galaxy Note II experience. It has a large array of new features that considerably boost its usability over what you can do with just your finger tips. Anyway, there's another way to launch apps - with gestures. You press the S Pen button and swipe up to access Quick command. Here you can draw a "@" sign to launch email, or "?" to do a quick search. Besides the symbol you can add a keyword - what to search for with the "?" or define search range for the "@": recipient, message body or both.